How did the idea to start the project emerge? 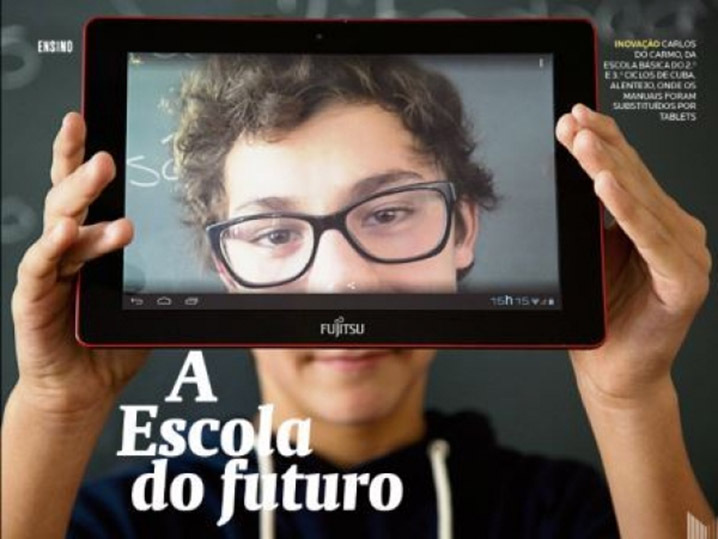 The General Directorate of Education – Management Services of the Alentejo Region, has a long tradition of intervening on educational technology field. This activity is one more that reflects the constant questioning of the educational improvement horizons, this time particularly concerning the textbook versus digital textbook issue. At his moment the 1:1 scenario on the classroom is real possibility and, in our view, a real opportunity to test if the digital textbook can add something to the learning process. 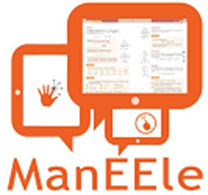 The project on digital textbooks (ManEEle), coordinated by the within Cuba’s School Cluster, with two classes of the 3rd cycle of basic education. 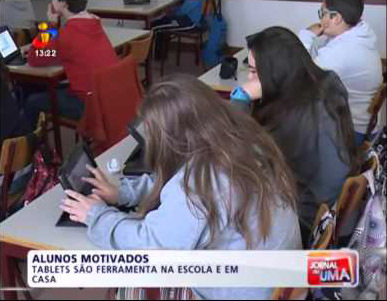 The project started in September 2013 and involved two classes that were then in 7th grade, foreseeing its monitoring over the entire cycle route. 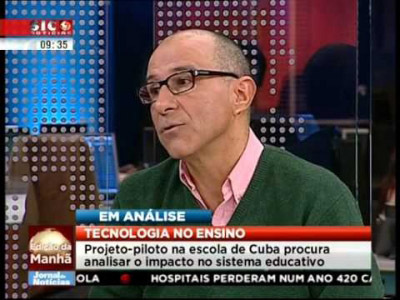 In Portugal there never was a project that totally changed from paper to digital textbooks, for such a long time, 3 years. The methodology of the 1:1 classroom environment appeals the very different skills and competences. Classes are different, students learn instead of being taught, therefore we found a clear development of very important skills for the future of the students, such as problem solving, critical thinking, communication, collaboration. Our findings focus primarily on the student dimension and on answering the questions related to enhancing the learning process. As for the concern whether students demonstrate digital proficiency, students, for the most part, state that they do not have problems with the use of tablets. They affirm that they do not use the tablet daily for games, and that they are more motivated by the simple use of the equipment. In addition, they do not ask for help from parents or teachers to use the tablet. Another important question is related to motivation. The research tried to confirm whether students have become more motivated and able to develop in-class activities and skills that they did not develop in non-technologically enriched environments. In fact, students consider that they feel more motivated to use the tablet, a view shared by teachers. However, this motivation does not have proper matching in school results. Albeit not substantially, students end up using the tablet in activities that would not exist without it. Naturally and steadily, access to textbooks, but also research activities on the Internet, were performed with some frequency, allowing students to acquire multiple skills. 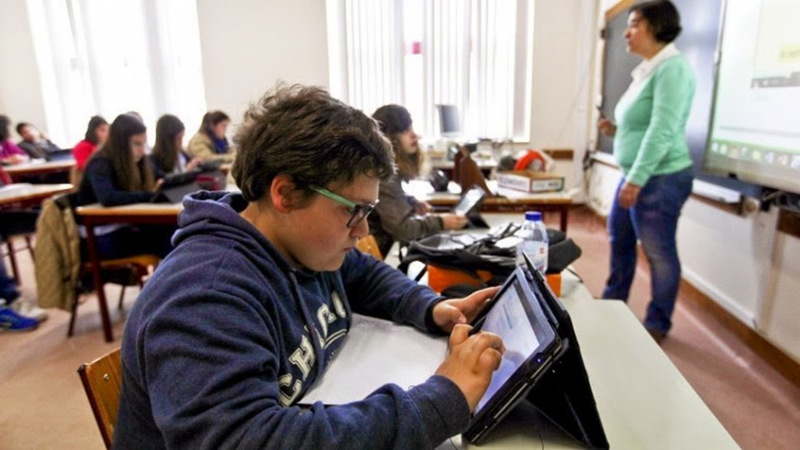 The low level of use of other features, in addition to access to digital textbooks, also holds up with the attitude of teachers who, throughout the year, did not request much tablet use for other activities. It should be noted that students have the perception that they do not learn more by having the tablet, and most of them still prefer reading the textbook on paper than on the tablet. Regarding the question if the student learning process materialized in their grades and, when compared to previous school years, if it fell under normal standards for this grade level, the study we conducted is not conclusive. Nevertheless, we should note that, at the end of the three years, in a joint meeting, it became clear that, in general, expectations had been exceeded. In fact, analyzing the profile of students grades, it would appear that the tablet has not had a negative impact on learning. The requirement stated by teachers, the grades obtained and the number of students retained show that students would not have had better grades and would not have had learned more if they had had nothing but the tablet to access the school textbook. In fact, we can say that even in one of the target disciplines (Portuguese), students maintained their average scores of the previous year. What are then the critical success factors for the integration of tablets and digital textbooks in the teaching-learning process? A global analysis of the data obtained in this project allows us to identify a set of factors that can contribute to the successful implementation of the use of digital textbooks in the learning process. This change in strategy can effectively start by replacing the textbook on paper for digital books, but it also can, and should, allow the use of a diverse set of existing digital tools to support learning and enable a paradigm shift in teaching processes. Thus, the analysis of available data, including literature, suggests that there are critical factors that must be taken into account in the planning of a project of this nature. Tablets must display appropriate characteristics to their use as a textbook replacement, including robustness, large data storage and good processing speed. It is necessary to take into account the need of technical support for hardware and software that eliminates operating constraints of equipment and peripherals. Also, wireless networks should have bandwidth and high coverage on campus. Teachers should be provided with training in the use of tablets and in innovative teaching practices, in order to refocus the learning process on students. This training must be done on an ongoing basis within the school, but also in close coordination with Training Centres and Universities. Institutional leadership must offer express and effective support to the changes you want to see implemented in their educational territory. Communities of practice of teachers for performance enhancement and sharing practices should be induced using virtual environments appropriate to learning. Parents and guardians should be involved systematically in this process, guiding them to monitor the students in their learning and in particular for the proper use of Internet at home. The school library and teachers should combine efforts to articulate their work and contribute to the continued promotion of the use of digital media for reading, in addition to the digital manual. Local (municipalities, businesses and other organizations) or national (publishers) partnerships must be created as costs associated with digital manuals are substantially lower to printed manuals. Students must also have continuous monitoring, ICT classes or clubs / workshops to learn how to use ICT and tablets. Their digital proficiency does not often exceed the games and the use of social media. Writing a text or making a presentation can be tasks that pose unexpected problems.